The trip begins and ends in Bangkok, Thailand’s bustling and unforgettable capital. From there you go off the beaten path and onto the Khmer Trail by visiting some of Cambodia’s most amazing spots. 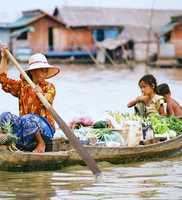 You’ll also travel up the Mekong River to Laos where you will experience life the way it has been for centuries. From there it is off to the coolness of the mountains where meditation is a way of life. No trip to the region would be complete with visiting its many temples and this trip has that covered as well. This is an ancient journey made easy by a guided tour that arranges everything. All you need to do is sit back, relax and be prepared to be blown away by the beauty and the charm that resonates throughout Thailand, Cambodia and Laos. What’s more, you can do this while traveling with like minded independent travelers. More adventure trips and tours.